Almost 3/4 of the Earth is covered by oceans (71%). They have huge ecological and economic importance to us. How? Ecologically, the oceans help moderate the Earth’s climate by absorbing heat from the sun and tropical regions and spreading it along the coastlines and other areas of the world with ocean currents driven by wind and planet rotation. The phytoplankton that coats the ocean’s surface absorbs our carbon dioxide waste and gives off life-giving oxygen. The ocean receives our sewage, farm and household wastes, dilutes them and slowly breaks them down, like a huge, natural sewage treatment plant. More than 250,000 species of animals and plants make their homes in the ocean adding greatly to the Earth’s biodiversity and feeding millions of people every year. This is also one of the ocean’s economic roles, as thousand of people take to the sea to collect food to feed their families or make a living. The oceans provide coastal habitats like wetlands and mangroves that protect the coastlines from storm surges and tidal waves. We mine the oceans for minerals, drill for oil and gas, and harvest plants and animals for making medicines or to enjoy in our aquarium tanks. We swim, surf, dive, motor, sail and ski all over the oceans for recreation. We gain vast amounts of scientific knowledge by studying the ocean. Yet our care of this vital resource does not reflect its great importance to us. We have overfished many areas of the ocean to the point where certain species are near extinction. Sewage, chemical wastes and garbage flows into the ocean from many urban areas around the world down rivers and storm drains and off boats. Plastics have begun to pile up in the ocean, endangering wildlife and polluting our beaches and waterways. Ocean animals choke on, become entangled in and are poisoned by ocean debris. 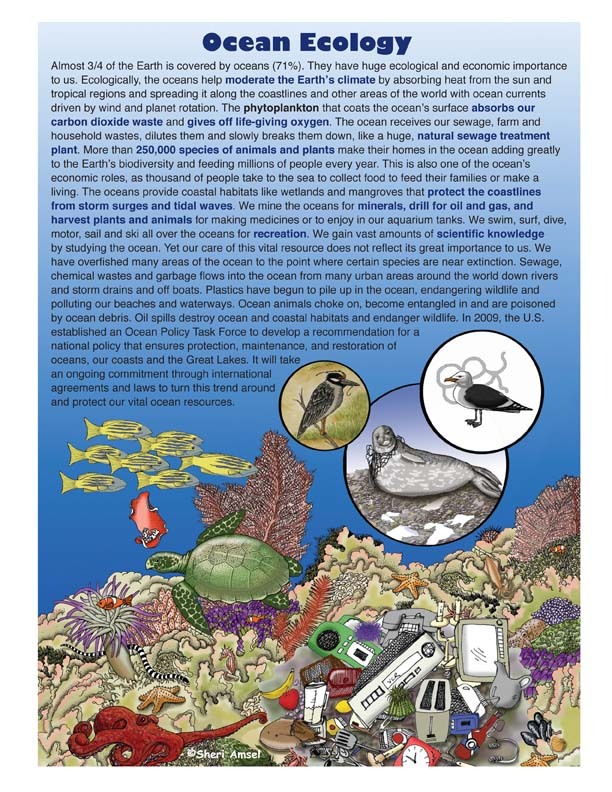 Oil spills destroy ocean and coastal habitats and endanger wildlife. In 2009, the U.S. established an Ocean Policy Task Force to develop a recommendation for a national policy that ensures protection, maintenance, and restoration of oceans, our coasts and the Great Lakes. It will take an ongoing commitment through international agreements and laws to turn this trend around and protect our vital ocean resources.